This weekend I’m ending three weeks in the U.K. and I have many good new memories, many of which have to do with places I saw that I had no plans to see. How did that happen? I wanted to practice being curious on this trip. To be more observant so I would maximize every moment. That meant that I had to really listen to the people I spoke with, and then ask good open-ended follow-up questions. It also meant keeping my senses alert as I was busy doing what I had planned to do. I had to be ready to go off schedule. In the end, I had a whole lot of unplanned but generally welcome experiences. If we and our teams practised being more curious, we might see a lot more creativity in our ministries. Here are the unplanned things I did just during my time in the U.K.
Abbotsford, home of Sir Walter Scott. 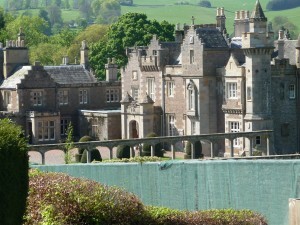 After visiting Melrose Abbey I left the town and passed a sign for Abbotsford, the country home of Sir Walter Scott. I know very little of Scott, but I always enjoy seeing a house so I thought “Why not?” It was only a few minutes away so off I went. What a delight! 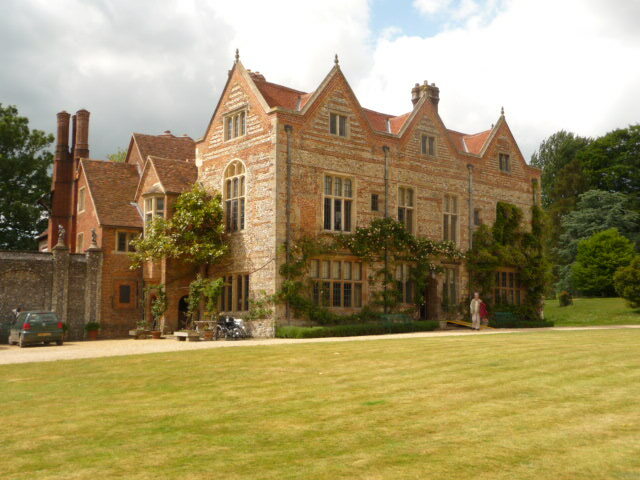 He built it new but made it look quite old, like a sixteenth century manor house. It was a beautiful property. I planned to drive from Edinburgh to Inverary, even though my destination was Paisley, because I wanted to get a bit further north and see, if not the Highlands, at least the semi-Highlands (or whatever this region is called). The road to Inverary zigged and zagged through the increasingly steeper and higher hills with lochs in-between them. It reminded me of the drive north from Vancouver to Whistler, except that these hills are not the Rockies of course. But the effect they have is similar. As I rounded the head of the last loch before Inverary, I caught a glimpse off to my right of a castle. I thought, “Whoa, I should check this out.” The driveway into the park was just around the corner and the sign said the castle was open. 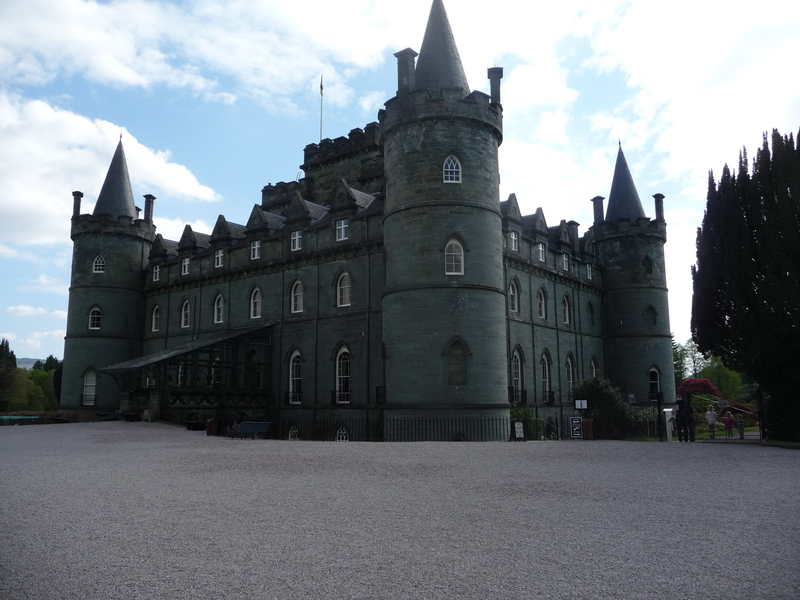 So I went and saw Inverary Castle, which is owned by the thirteenth Duke of Argyle, a man about forty years old who inherited the castle, £40 million and a whole lot more. He married a daughter of the famous Cadbury family, so they’re not wanting for anything, yet they each have day jobs in London, which is where they live. They stay at the castle a few times a year. The central room in the castle is the armoury, which has a very impressive display of pikes, swords, rifles and the like, all beautifully arranged. But this room is impressive for another reason. It has the highest ceiling of any residence in Scotland for sure, and I think in Britain as well. The ceiling is an astounding 30 metres over your head! Not only that, but somehow the family’s coat-of-arms is painted on it too. 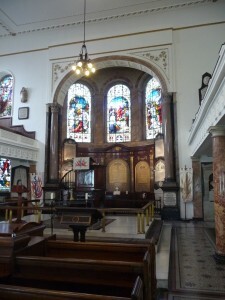 John Wesley’s church in London. While in London, walking several blocks to see Peter Gentle’s house (an ancestor of mine), I saw the back of what looked like a very interesting church. I decided that on my return walk I would walk back one block further over to see the front of it when I returned. 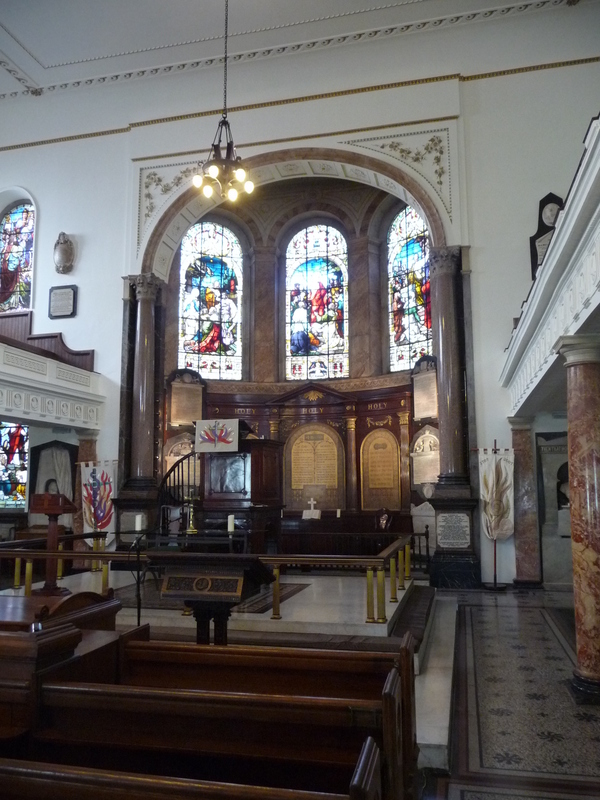 It turned out to be the church that Wesley built once it was clear that the break with the Church of England was permanent. He continued itinerant preaching most of the year, but during the winters preached here. It is a beautiful church. It has the widest unsupported roof span of any Georgian building (no posts). Very impressive. The posts that hold up the balcony were originally all ships masts. King George III gave used masts from old Royal Navy ships to Wesley for this purpose. One original post still exists in the narthex. 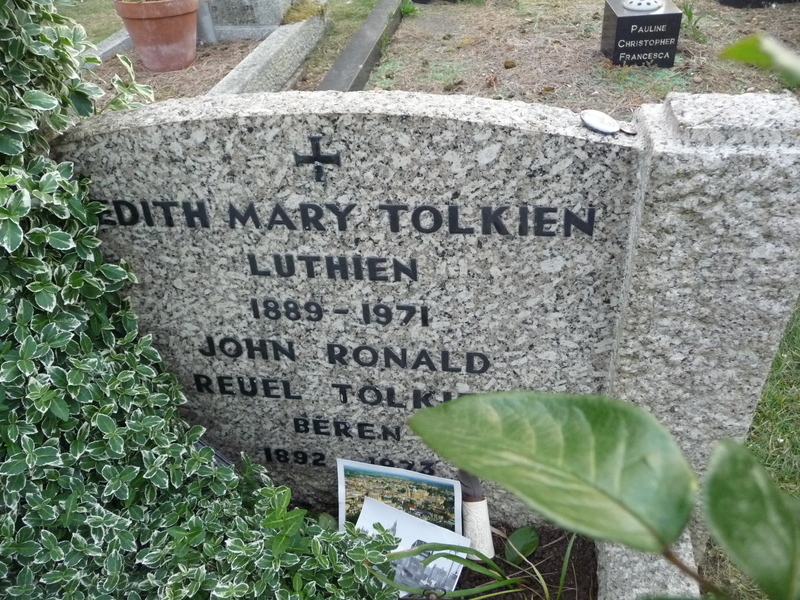 I saw a lot of graves of famous people mostly because their locations were mentioned in guidebooks that I purchased. 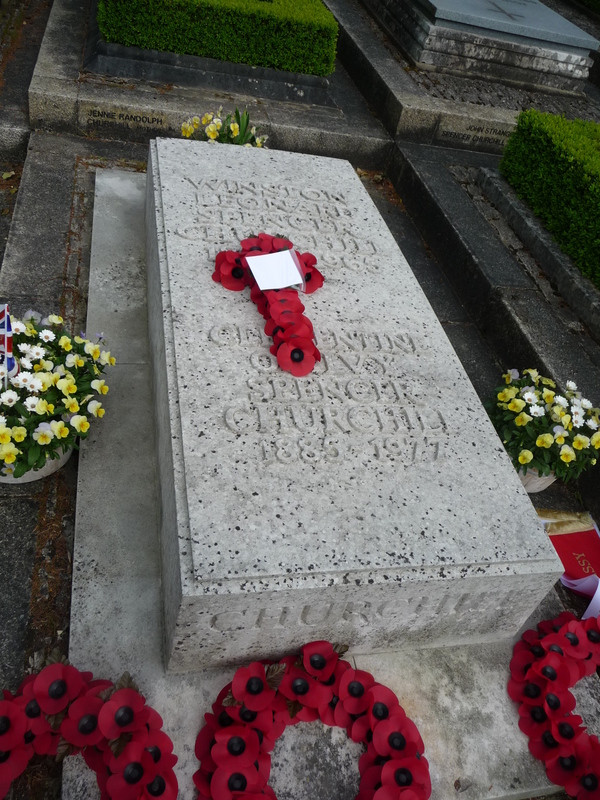 These graves were not at the sites I was visiting, but nearby, so I went to see them. While at Blenheim, I went to Winston Churchill’s grave. 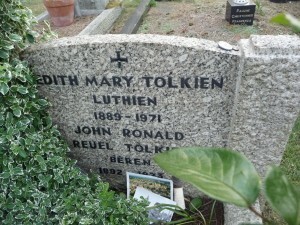 While in Oxford, I went to two nearby towns to see the graves of Tolkien and Lewis. While visiting John Wesley’s church, I talked with a person who mentioned as I was leaving, “Would you like to see Wesley’s grave?” It was right there in the churchyard. This conversation only happened because I originally approached her with a question, and I would have kicked myself later to discover it had been so close and yet to have missed it. 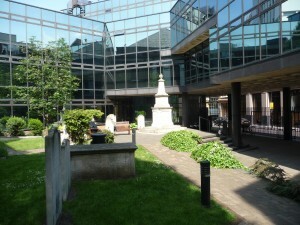 An office building has been built on most of what used to be the burial ground with the result that Wesley’s grave is surrounded on three sides by offices. I thought this was strangely appropriate, given his desire in life to go to where the people are. When I mentioned this to the lady, she said just the other day someone from one of the offices came to see the church because he had been looking down at it from his office window for several years and thought he should finally see what the church is all about. The secular and sacred come together at Wesley’s final resting place. 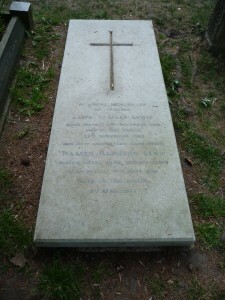 Wesley’s grave (the tall monument). It’s behind his church and surrounded by an office building. He’d love that his grave is in the midst of regular workaday life! 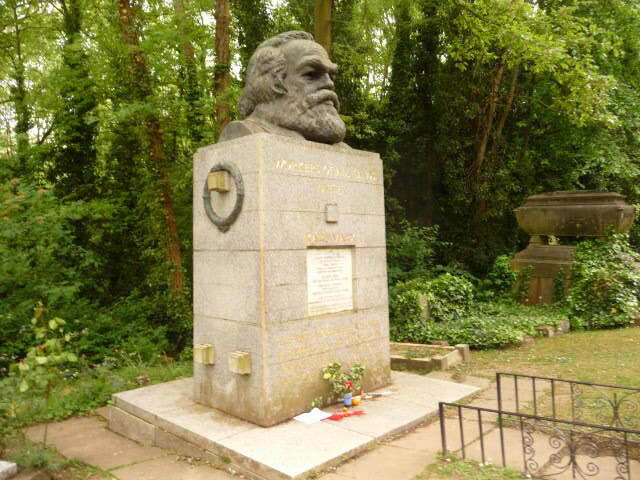 I saw Karl Marx’s grave in Highgate Cemetery by looking around while walking to yet another ancestor’s grave. You can’t miss Marx because a huge bust of his head sits atop his tombstone. It is so oversized I don’t know how it has stayed on. 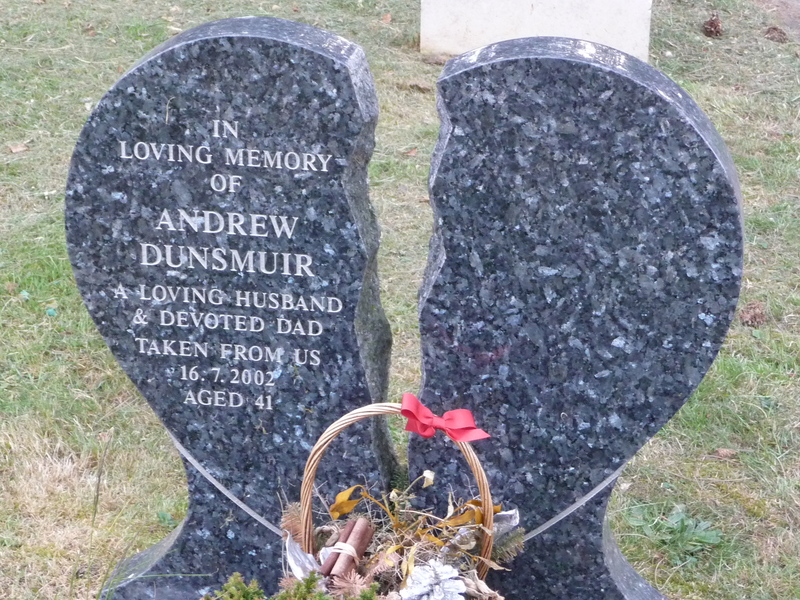 In loving memory of Andrew Dunsmuir, a loving husband and devoted dad taken from us 16.7.2002 aged 41. An early death left a broken-hearted widow. A monument to John Knox at the Necropolis in Glasgow. While in Paisley, I was chatting with the host at the bed & breakfast when he suggested that I go see downtown Glasgow. I hadn’t planned to, but I did. 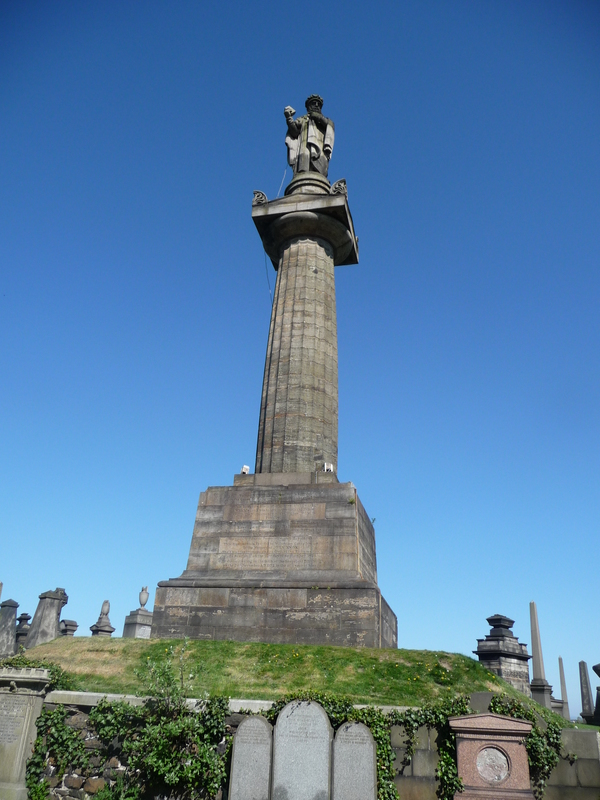 As a result, I discovered the cathedral, which was impressive on its own, but then from there I heard about the Necropolis, so I walked over to see that, and at the top I discovered a monument to John Knox that actually pre-existed the Necropolis. If what I read online is correct, John Knox is buried at St. Gile’s Cathedral, which I visited, but the burial ground is covered now by a parking lot, and he is buried under spot #23. This monument in the Necropolis is probably the best memorial you will find for him. While using the Tube, I was bombarded with advertising. One of the posters was for a new Andrew Lloyd Webber play. I’m going to save you 3 hours of time plus the cost of a ticket (or two) with a brief theatre review. Webber’s new show Love Never Dies, is a sequel to Phantom of the Opera and I thought it would be fun to see a show in London. I decided not to read any reviews or plot details and just enjoy it as a fresh story. My mistake. I give it two thumbs down, four if you will lend me yours! To prepare, I went to see the original Phantom of the Opera the night before I was to see the sequel. The Phantom is still in its original run in London, with a continuous 25 years at Her Majesty’s Theatre. The first time I saw it, Brian Mulroney was Prime Minister, I was a commercial banker and terrorism was something that affected people somewhere else. How time flies. The Phantom is a masterpiece. The sets are wonderful, the music is memorable and it’s an engaging story. Too bad the sequel is as different from the original as the times today are different from the times 25 years ago. I’m about to reveal some plot elements. If you don’t want to know, then stop reading here and skip three paragraphs down to the next heading. It appears Webber wanted to do the Phantom story over again but with the opposite outcome. So every character has the opposite qualities to what they had in the original. The Phantom is the good guy, Raoul is the gambling, drunk bad guy. Meg hates Christine, as does her mother Mme Giry. It turns out that Christine actually loved the Phantom all along, and in fact, had his child as a result of their previous acquaintance. The plot is so topsy-turvey that there is almost no continuity between the plays. Not only is the storyline bad, so is the music. You will not leave the theatre humming any melodies because this musical score has no melodies. The music is mostly written in the very highest registers of the vocalists’ ranges, and rather than a melody, the songs consist of the strangest interval jumps. It appears the score was written as a performance test for the singers and an endurance test for the audience. Only one song, the title song, has anything approaching a melody in a couple of its musical phrases. The ten year old Phantom’s son was played by an actor who looked about seven or eight, but boy could he sing! This kid will go places. There was enthusiastic applause at the end in recognition of the technical skill of the performers, but quite a few people around me were commenting as they left how they either couldn’t follow the story or how disappointed they were at the play’s outcome. Let’s be clear, this is a tragedy. No character ends up happy at all, but there are indications that the Phantom will end up with custody of his son. I was listening to the early morning lead up to the Royal Wedding on the radio while driving to Renfrew and Tollcross (in Scotland) and decided to pop back to my room to watch it on TV. I thought ‘Future king, don’t have to get up early, I like pageantry, I’m in the U.K., I should see it.” Because I was spontaneous I had the surprise delight of saying, “Hey, I know that man!” when I saw who was leading the service. It was the Bishop of London, who had given me Communion just the week before at St. Paul’s. Well, I don’t really know know him, and he certainly doesn’t know me, but I had a legitimate connection to him. So I felt part of the wedding service. Okay, smile. I have my tongue firmly in my cheek! Because an out-of-town appointment was moved to London, I had some extra time. 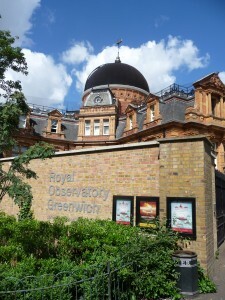 I was tempted to stay at my bed & breakfast and catch up on my blogging, but then I thought I should make hay while the sun is shining, so I went to Greenwich and looked around. The observatory was interesting even though there really isn’t much there to see. There is the Prime Meridian line of course, so you can stand in two hemispheres, East and West, at the same time. I hadn’t realized how supportive King George III was of science. He provided the telescopes for the second Royal Astronomer after the first took his own personal telescopes with him when he retired. The scientific purpose of King George’s gift was for the Royal Astronomer to find a better way for ships to know where they are. They could figure out the latitude easily enough, but had no way to know, when away from the shoreline, what their longitude was. The invention of a way to find one’s exact longitude is the legacy of the observatory. 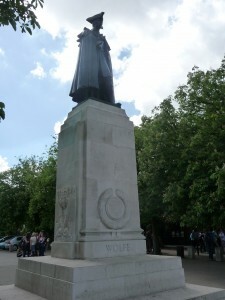 Canada’s statue of Gen. Wolfe at Greenwich Observatory. I’ve forgotten the connection, if any, between General Wolfe and Greenwich, but Canada erected a statue in Wolfe’s honour that has a prominent place near the observatory. After a meeting in Oxford, curiosity led me to check for tourist attractions near the route home. I found a house called Grey’s Court and went to see it. 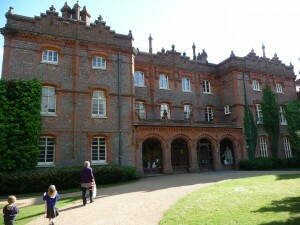 It offered a look at how a mid-twentieth century upper-class family lived in a very old country house. The house was quite plain and simple (although large and with a lot of land), but since it was frozen in time in the 1920s or so, it was quite interesting. There was some sheet music on the piano of a WWI musical revue called The Bing Boys Are Here, one of the most successful musical hits on the London stage during the war. This was a great find because it was this revue that inspired the Canadians on the battlefields of WWI to call themselves Byng’s Boys in honour of their commander, General Sir Julian Byng (later a Governor-General of Canada). 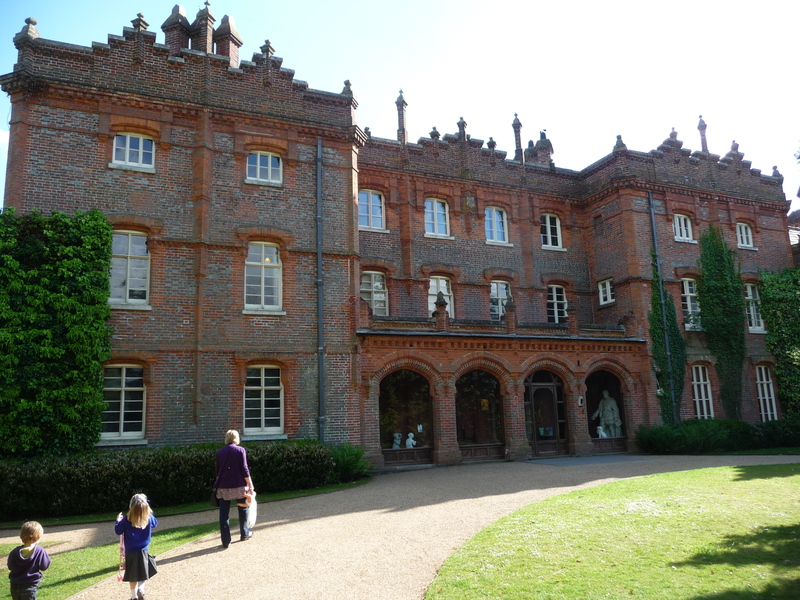 While at Grey’s Court, I saw a brochure for Hughenden, a much larger estate and the home of Benjamin Disraeli. It wasn’t too far away either, and it was open long long enough that I had time to tour it too. So off I went. And of course, I discovered that he is buried at the nearby church, so I saw his grave too. So, being curious gave me many very good memories, and just one that I’d rather forget (Love Never Dies). But not everything works out well, so rather than regret the play, I choose to think of it as the minimal cost of all the other benefits that curiosity gave me. Now, let’s practice being curious at work and see what develops. When I read “I wanted to practice being curious on this trip.” I thought what a great diversion to just “poke around” for the sake of it! I’ve enjoyed travelling with you through the Blogs.